The 1st Round table aiming to develop an integrated programme and an interregional initiative to achieve the implementation of Sustainable Development Goals in the Balkan Peninsula was carried out successfully in Vlasti Kozani, Greece on Saturday 17th of June, under the auspices of the Group on Earth Observation [GEO] the Ministry of Rural Development and Food and the Ministry of Digital Policy, Telecommunications and Posts.The Region of Western Macedonia and the Decentralized Administration of Epirus and Western Macedonia organized and hosted the activities of event, while Interbalkan Environment Center [i-BEC] acted as the accelerator of the whole endeavor in the Balkan region being Participating Organization of GEO. Mrs. Katerina Notopoulou from the Prime Minister’s Office also honored the event with her presence. The Minister of Rural Development and Food Mr. Evangelos Apostolou welcomed the event and focused on the need to strengthen the competitiveness of the agricultural sector by adopting Earth Observation applications in the national rural development policy with the aim of ensuring the highest quality in the agricultural products. The Minister highlighted that the goals of the Initiative for the increase of competitiveness in the agri-Food Sector in Balkans are in line with the Ministry’s strategic guidelines and highlight the need to engage and further assiste the cooperation of the stakeholders in the Balkans to establish the EO ecosystem towards the sustainable development. The Secretary General of Telecommunications and Posts Mr Vasilios Maglaras representing the Ministry of Digital Policy, Telecommunications and Information through stressed out the need to exploit research and scientific applications related to Earth observation for the modernization of agri-food sector and that the outcomes of the meeting must be incorporated to the implementation of the national digital strategy. In the light of the above, the need for co-operation between the two Ministries was pointed out to develop the necessary infrastructure to enhance digital agriculture. Mrs. Ryan Barbara, GEO’s Director-General, who honored the event with her presence, mentioned the importance of providing digital services to citizens through the incorporation of Earth observation capabilities into daily applications and the need for them to be disseminated in the Balkan countries with the aid of the Inter-Balkan Environmental Center as an interregional organization of GEO and as a Technology Broker. In this context, the need for an Earth Observation System of Systems (BalkanGEOSS) that will initially focus on monitoring the most important crops fulfilling the role of Balkan GEOGLAM in the Balkan region was highlighted. 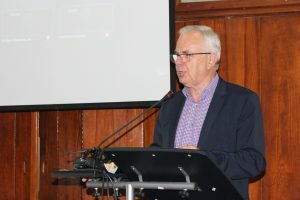 The Scientific Director of the Inter-Balkan Environmental Center, Professor George Zalidis coordinated the 1st Session of the Round Table Meeting that discussed the utilization of space technologies and applications for Sustainable Development Goals [SDGs] implementation related to the agri-food sector. 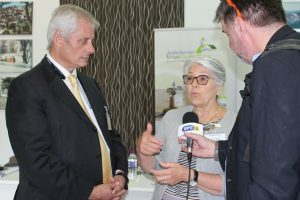 In particular, Michel Deshayes and Juan Pablo Guerschman coordinators of the Global Agricultural Monitoring Initiative [GEOGLAM] and GEOGLAM Rangeland and Pasture Productivity [GEOGLAM-RAPP], respectively, presented several applications that could be used to increase agricultural yields, reduction of ecological footprint, as well as the sustainable management of grasslands and pasturelands. 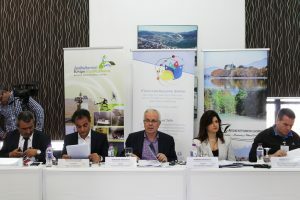 The representative of the Ministry of the Environment and Energy, Mr. Ioannis Kazoglou, stressed out that remote sensing practices should be used as part of the national strategy for rural development and the protection of natural resources. The utilization of modern technological tools in the agri-food sector were made by videoconferencing by Brian Killough, NASA and Committee in Earth Observation satellites [CEOS] scientist and, Espen Volden and Gordon Campbell, as representatives of the European Space Agency [ESA] for the Balkan Peninsula region. All speakers referred to the significant potential exploitation of multi-dimensional data-processing structures such as the Data Cube and the Thematic Exploitation Platforms for increasing the competitiveness and sustainability of agricultural practices. These applications have already been utilized in a number of countries and thematic sectors and the speakers underlined the common belief that these opportunities could be exploited in the Balkans through the Contact Points set up by GEO-CRADLE to strengthen the agricultural sector. Lawrence Friedl, Director of NASA’s Applied Science Program and Aditya Agrawal Director of the GPSDD highlighted the value of satellite data availability for monitoring SDGs. Summarizing, at the end of the Session, the Rector of the Aristotle University of Thessaloniki, Mr. Pericles Mitkas, emphasized the role of AUTH in the interconnection of research with the productive sector and set the year 2018 as a landmark year for the further interconnection of i-BEC in the Balkans, while Mr. Athanasios Paliatsos, special advisor of the Directorate of Radio Spectrum and Satellite Communications focused on the need for co-operation between stakeholders so that Earth Observation Systems can be harnessed to the benefit of many sectors of the agri-food economy. The discussion followed by representatives of the ecosystem of stakeholders from the Balkan region in order to draw up a plan to improve the implementation of regional development policies to actively support entrepreneurship. The participation of the majority of the Coordinators of the Decentralized Administrations (with the exception of the Coordinator of the Decentralized Administration of Attica) in the event played a significant role on its outcomes since these Bodies affect the implementation of cross-border and regional policies of the country. Nikolai Chanev, Regional Governor of Kardzhali (Bulgaria), the Deputy Regional Governor of the Region of Central Macedonia Fanis Pappas and the Deputy Governor Mr. Panagiotis Plakentas emphasized the importance of cooperation between cross-border countries and the need to integrate Earth Observation applications into the Regional Operational Programs enhancing the funding for Small and Medium Enterprises to increase their competitiveness. Mr. Kyriakos Loufakis, President of the Greek International Business Association and Alexander Zarkov, Director of the Chambers of Commerce of Macedonia highlighted that the Chambers of Commence in the Balkans would be very interested in certified labelled products as reduced input practices products using Earth Observation applications and proposed to organize a round table on entrepreneurship in the Balkans. Finally, interventions were made by the President of the Geotechnical Chamber Mr. Spyros Mamalis, the Technical Chamber’s representative Mr. George Tsakoumis and the Vice President of the Central Union of Chambers Mr. Pavlos Tonikidis, focusing on the need for a long-term national planning for economic development that will include specific measures and mechanisms for the further adoption of innovative digital technologies. The meeting was completed after the interventions of Μr. Theodoros Karypidis, Governor of the Region of the western Macedonia and Mr. Vasileios Michelakis, Coordinator of the Decentralized Administration of Epirus and Western Macedonia.